This is for all the strong women out there who are sick and tired of having to explain themselves or endlessly apologize just for being who they are, and doing what they do. Here’s to all the women who are tired of being weighed and measured and found to lacking in your eyes, stop looking at us. Here’s to all the women who are sick and tired of being pulled down by other women. If you cannot see the worth in knowing and championing strong women, step back before we mow you over. Here’s to all the women who are sick and tired of being pulled down by the men around them. Hey you, if cannot see the worth in championing strong women, step back because we are going to mow over you. Here’s to all the mothers out there who stand next to their children making the hard choices, unpopular choices, to keep their kids on the right path and lead the way when they get lost. Here’s to all the sisters who sister women who do not have sisters. Here’s to all the mothers who mother people without mothers. Here’s to all the mothers who mother other people’s children, you know the ones with mothers who won’t mother. Here’s to all the grandmothers who are still mothering and often someone else’s children. Here’s to all the women married to a partner they stand completely behind, they are invisible like the roots of a mighty tree, holding it up without anyone seeing the depth of their support. Here’s to the women who have entire families standing on their backs. Here’s to the women who silently pray for humanity. Thanks! Here’s to all the women living in the world of men. Here’s to all the women who live in the world of women. Here’s to all the men who support women, May God shine brightly on your life! 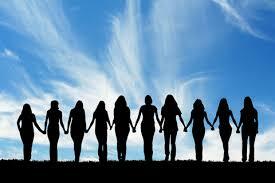 Through strength of will women can change the world, believe it!